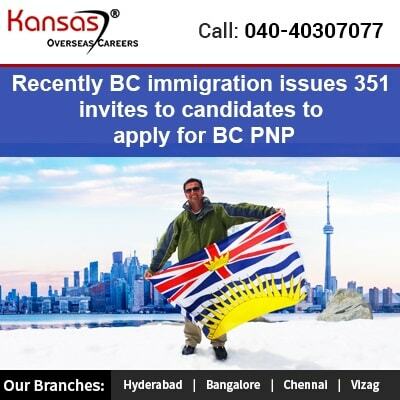 Recently, British Columbia immigration sent nearing to 351 invites to candidates who have applied for BCPNP. The invites were sent to Express Entry category as well as skills immigration category. The candidates who scored low scores ranging from 65 to 91 points depending upon the category were issued invites to British Columbia Provincial Nominee Program. The points get assigned when the candidates register through the BCPNP Skills Immigration Registration System(SIRS) and they are awarded based on economic as well as human capital factors, such as work experience, education and language abilities. Under the SIRS, a maximum point available to the candidates is 200 points. The candidates who were invited recently on Oct 3rd, 2018 draw were required to have a full-time job offer indeterminate in nature from an employer in the province. Those candidates who have got invites under the Express Entry BC categories received extra 600 points towards their Express Entry Comprehensive Ranking System(CRS) once their provincial nomination gets approved by the province. The candidates having the provincial nomination move forward in the line for the Invitation to Apply (ITA) for Canadian Permanent Residence in a subsequent Federal Express Entry Draw. The rest skills immigration candidates who got a British Columbia Provincial Nomination would have their Canada Permanent Residence applications processed by Immigration, Refugees and Citizenship Canada (IRCC) separate from the Express Entry system. The candidates aspiring for Canadian immigration having minimum 1 year of skilled work experience they would more likely assimilate themselves into the Canadian labour market. The above experience would enable them to become a contributing member of Canada’s economy as well as the local community. There exist numerous programs that assign a point value for your work experience, including the skilled worker as well as Provincial Nominee Programs. The above program help in promoting the work experience as a valuable asset, hence thereby increasing your chances of successfully immigrating to Canada. If you wish to increase your chances to successfully immigrate to Canada, we appreciate you to talk to our top immigration experts they will help you to enhance your Canada Immigration options. for more details you can send message :info@kansasxpress.com.